Delhi-based artist Gopa Trivedi takes inspiration from the seemingly insignificant every day spaces and incorporates into her works the characteristics and implications specifically related to spaces; degeneration, time, fragmentation. She is receptive of the subtleties and the nuances of a given space. Her works suggest a timeless silence and a contemplative aesthetic space characterized by a suspended calmness with the monochrome canvas reflecting a deeper, complex metaphysical concern as intricate emotions act as ‘protagonists’. According to Trivedi the domestic space is an apt example of how everything is interdependent, how the inside is affected by the outside and vis-à-vis. Like cocoons, spaces have experienced their inhabitants and are agencies of biographies of the lives that take root in them. Spaces represent not only individuals, but also social and cultural contexts: “my works deal with the portrayal of materialism of an ordinary middle class life. Majorly non-figurative, they reflect the embodied response-able objects from a middle class household. The objects in my works become personifications of relationships … my works contour the domestic spaces revealing absence within the seeming wholeness of their being." Her works are attempts to address social and individual anxieties through the degeneration that happens within every day, whether it’s a person or an object or a community. Gopa has been trained under traditional miniaturists; She employs their stylistic sensibilities, but she toys with the ideas of scale and perspectives. 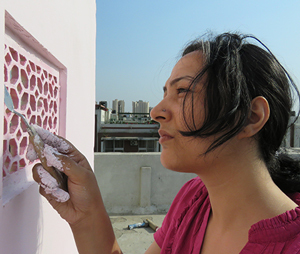 She uses the traditional Sanghaneri paper, natural pigments, khadiya and arabic gum as preferred mediums. The medium of her work permeates between the past and the present. If she has been recently exploring the digital medium, her sensibilities are yet anchored in that of the miniature practice. Gopa Trivedi (born in 1987) completed her Master in Visual Arts (Painting), 2012 from Faculty of Fine Arts, M. S. University of Baroda, India. Her works have been part of several shows in India and Pakistan including the monographic exhibition, ‘In Pursuit Of Silence’ - Gallery Art Konsult - New Delhi, 2015; VadFest - Baroda, Gujarat, 2015; ‘A4’ - Priyasri Gallery - Baroda, Gujarat, 2015; ‘Baroda Nexus’ - Art Konsult Gallery - New Delhi, 2015; ‘Re-constructing Home’ - Satrang Gallery - Islamabad, Pakistan, 2015; ‘The making of meaning’ - Zahoor ul Alkhlak Gallery - Lahore, Pakistan, 2014; ‘Break Out’- Red Earth Gallery - Baroda, Gujarat, 2014; ‘Allegories’ - Art Konsult Gallery - New Delhi, 2012 etc... She participated in the United Art Fair in 2012. Gopa received the Beaconhouse National University Award in 2012 and the Nasreen Mohemmedi Scholarship in 2011 among others. Gopa lives and works in Delhi.